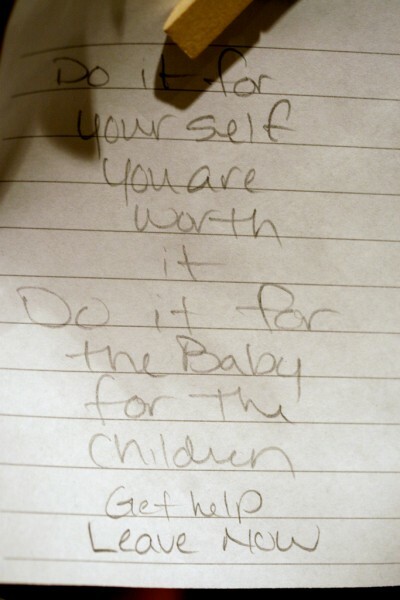 A note to victims of domestic abuse. Photo by The Waiting Room / Domestic Violence Tableau. Used under a CC BY-NC-SA 2.0 license. Bermuda's only safe house for victims of domestic abuse has been forced to shut down because it lacked sufficient funding to operate. According to news site The Royal Gazette , the shelter housed 31 women and children last year. A lack of donations and cuts to a government grant contributed to the “critical” money shortage. The development is disturbing, given the country's domestic violence statistics. A 2013 Bermuda Health Council report  found, among other things, that one in eight adults had experienced domestic violence and that women and children were the usual targets, making at least one in five of Bermudian women recipients of domestic abuse. Another report , albeit more dated, suggested that the incidence of domestic abuse was up 7 percent from 2006 to 2011. The country's most recent crime statistics  do not categorise different types of violent crime, but in general, it appears as if sexual assault and crimes against minors have surged, suggesting an increase in the incidence of domestic violence. Bermuda is now without a safe house for women escaping domestic violence. This fact alone is a sad condemnation of Bermuda’s misplaced priorities regarding how we spend our money – for an island of our wealth, it is shocking we cannot fund such an important service, and in doing so we are condemning women and children (who make up the majority of domestic violence victims) to abuse and possibly even murder. The safe house run by the Centre Against Abuse isn’t the magic bullet to end domestic violence, but it is a key part in dealing with the problem and helping to break cycles of abuse.